Rocker B Ranch is kicking off the inaugural Backroads Music Fest on July 5th and 6th. A patriotic, two-day country music festival featuring the Randy Rogers Band, Casey Donahew, Koe Wetzel, Wade Bowen, Stoney LaRue, Mike Ryan, Pat Green, and Micky and the Motorcars! Jam out to the best in Texas country and enjoy a variety of outdoor activities, delicious food vendors, and unique pop-up shops. Located one hour west of Fort Worth and only ten minutes from Possum Kingdom Lake, Rocker B Ranch is one of the finest private venues in the country. With over three hundred acres of beautiful land that was once inhabited by the great Native Americans, this premier ranch venue is a place where you can escape the city noise and experience life on the backroads. With its brand new, custom amphitheater, situated on the most pristinely manicured grounds, Rocker B Ranch invites you to the first annual Backroads Music Fest on July 5th and 6th in Graford, Texas. Bring the whole crew out for some patriotic fun in the sun. This is a family event so all kids 5 and under are totally free! 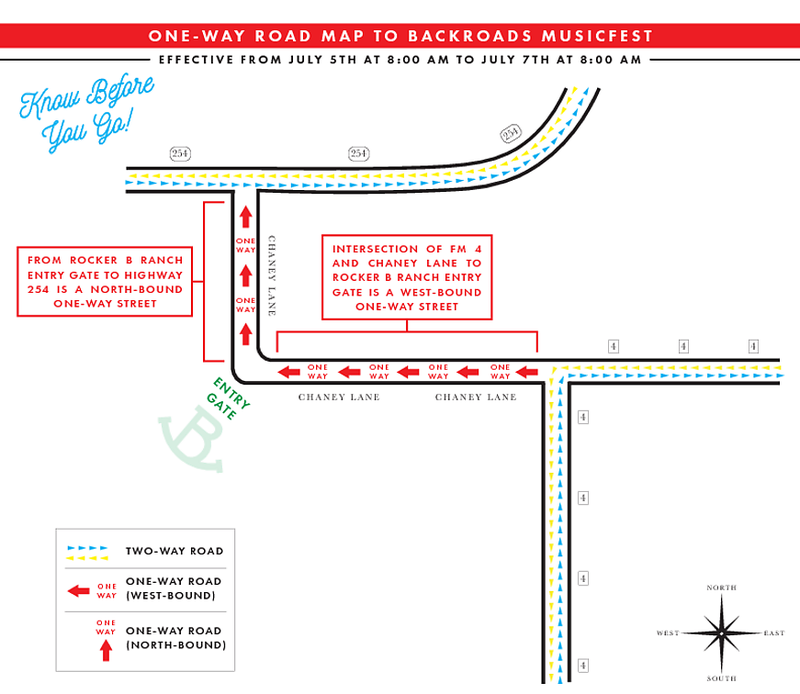 When attending Backroads Music Fest, please use our planned entry route. To take this route, simply follow Highway 254 to FM 4, where you will then exit for the Rocker B Ranch.